Two recent scientific reports warn that the world is on the brink of run-away global warming. Nevertheless, Luther College is demonstrating it is possible to reduce greenhouse gas emissions fast enough to avoid catastrophic climate change. Earlier this year the United Nations Intergovernmental Panel on Climate Change (IPCC) warned that Earth has already warmed by about 1 degree Celsius since pre-industrial times and that we are on track to warm by another 2-3°C by the end of the century unless drastic action is taken. This rate of warming is unprecedented in human history. According to the recently-published Fourth National Climate Assessment produced by an inter-agency working group of U.S. scientists, "Earth's climate is now changing faster than at any point in the history of modern civilization...[G]lobal average temperature is much higher, and is rising more rapidly, than anything modern civilization has experienced, with widespread and growing impacts." Scientists are warning that the current rate of global warming will lead to forms of climate change that will have catastrophic effects on society—especially for those who are poor and vulnerable. Heeding this concern, the signatories to the United Nations 2015 Paris Agreement affirmed the goal of holding global warming to "well below 2°C above pre-industrial levels and to pursue efforts to limit the temperature increase to 1.5°C." The IPCC says global emissions must peak by 2020 and then decline at least 45 percent by 2030 to preserve a chance of limiting global warming to 1.5°C. Unfortunately, global greenhouse gas emissions are still increasing and the emission reduction pledges nations made in Paris are grossly insufficient. 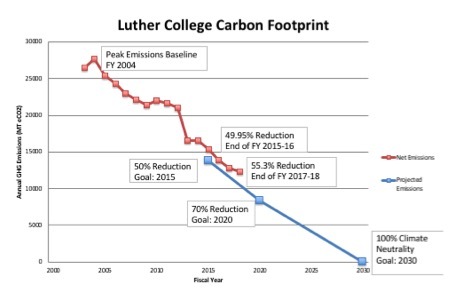 Luther College is proving, however, that it is possible to reduce greenhouse gas emissions at the rate required to prevent catastrophic climate change. Luther has reduced its emissions 55 percent from 2003 to 2018 and aims to be carbon neutral by 2030. The Board of Regents recently reaffirmed this goal in the college's new strategic plan. Luther has achieved its emission reductions by making significant investments in energy efficiency and renewable energy. Various energy efficiency measures have cut Luther's electricity consumption by one third and have also resulted in modest decreases in heating fuel consumption. While these investments are responsible for most of Luther's emission reductions, most are not aware that they have also saved the college over $2.7 million since 2003. We have reduced our greenhouse gas emissions while also reducing the college's operating costs. On the renewables side, Baker Village is the first part of the Luther campus that can claim to be carbon neutral because it is entirely heated and cooled by geothermal energy from the earth and powered electrically by solar photovoltaic energy from the sun. In addition, Luther's wind turbine and solar arrays currently produce 35 percent of the power consumed on the main campus. 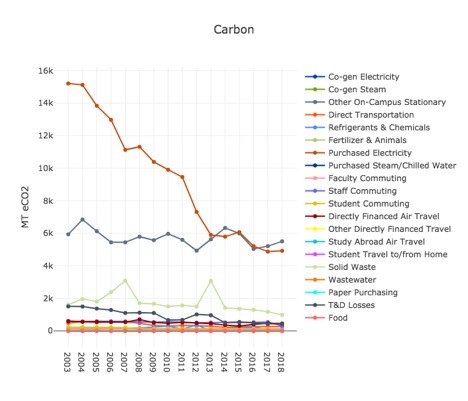 As the graph below shows, these investments in energy efficiency and renewable energy have significantly reduced Luther's carbon emissions from electricity purchases. The same can be said for solid waste and fleet vehicles. By investing in recycling infrastructure and education, Luther has reduced the amount of waste we haul to the Winneshiek County Landfill by 68 percent over the last 10 years. Luther's investments in gasoline-electric hybrid fleet vehicles over the last 15 years have reduced our emissions by 61 percent. Luther's next greenhouse gas reduction goal is 70 percent by 2020. That may seem like a big step from our 55 percent reduction today, but the good news on energy efficiency is that low-hanging fruit grows back! We have identified over 40 new energy efficiency measures we can take over the next year that will reduce our electricity consumption by another 20 percent and our carbon footprint by 10 percent. Collectively, these measures have less than a five-year payback, which will enable Luther to save hundreds of thousands of dollars in the years ahead. On the renewables side, we are considering partnering with some investors on a new solar + storage project that will help us generate more electricity from the sun while also saving money by reducing our demand charge for electricity. Over the long term, Luther will never achieve its goal of carbon neutrality by 2030 so long as we heat the campus via steam produced by the combustion of natural gas at Korsrud Heating Plant. As a result, we are actively studying how to heat the campus in different ways. Stay tuned for more on that important front. Climate negotiators from every nation are meeting right now in Katowice, Poland. They are trying to agree on binding rules to implement the Paris Agreement. They also hope to inspire the nations of the world to commit to even more aggressive greenhouse gas emission reduction goals. The challenge is daunting and the situation is discouraging, but Luther College is demonstrating that it is possible to reduce greenhouse gas emissions at the rate required to prevent catastrophic climate change. Luther is leading the way. Jim Martin-Schramm joined the Religion faculty at Luther College in 1993. He is anordained member of the Evangelical Lutheran Church in America and has a doctorate in Christian Ethics from Union Theological Seminary in New York City. Most of his scholarship has focused on issues related to ethics and public policy, and a lot of his recent work has been in energy and climate policy. He spent most of his youth growing up in Germany and South Africa because his father worked for John Deere. Those years gave him a global perspective that has influenced his career in various ways. He has been involved in various campus sustainability initiatives at Luther and is active in various organization in Iowa working on climate change and energy issues. He currently chairs the Energy and Water Task Group of the Campus Sustainability Council. Yes. Let's do it, Luther College. Have the data shown in the figures been corrected for enrollment and employment changes over time?